Sale - De website van girlswithguns-clothing! This moisture wicking comfort stretch tee is designed to fit women. The flat lock stitching ensures comfort. Zeobond scent controle helps to reduce human detection in the field. This lightweight pant is ideal for warmer conditions. 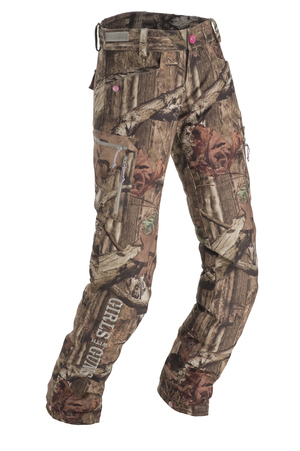 GwG has designed hunting pants with every hunting scenario in mind. The lightweight pants are wind resistant, have a velcro adjusable waist and length, has 6 pockets. Subtle deer tracks on the back of the leg, GwG Buck logo on the rear belt loop, and GwG embroidery on the front of the leg make these pants fashionable. This midweight pant is ideal for cooler conditions. The midweight pants are wind resistant, have a velcro adjustable waist and length and has 6 pockets. Embossed, soft, micro tricot lining ensures comfort. Introducing the next generation of hunting pants - the Aoraki Lightweight Pant. This innovative pant features a 4-way stretch and articulated knees for a better range of motion, giving them a second skin feel and allowing them to move with your body. 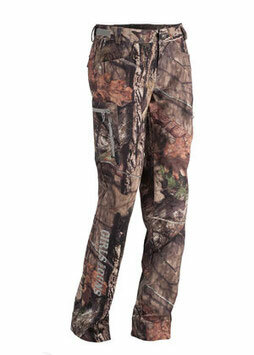 Designed with a breathable fabric with a DWR water resistant finish, this lightweight hunting pant KNOWS NO BOUNDARIES. Customize your perfect fit with our signature adjustable waistband and inseam (32-36 inch inseam). Available in Veil® Alpine® and Mossy Oak® Break-Up Country®. Fashion meets function in this versatile Midweight Jacket, perfect for many conditions. Velcro adjustable cuff, waist, license loop, and harness slit. Hight performance, wind resistant soft-shell with DWR treatment, soft GwG embossed micro tricot lining and a removable adjustable hood. Introducing the next generation of hunting pants - the Artemis Midweight 3 Layer Softshell Pant. This innovative pant features a 4-way stretch and articulated knees for a better range of motion, giving them a second skin feel and allowing them to move with your body. Designed with an extremely breathable, windproof fabric with a highly water resistant finish (DWR), this midweight 3 layer soft shell hunting pant KNOWS NO BOUNDARIES. The addition of a minky soft high pile fleece interior for added warmth upgrades the Artemis pant from its lightweight sister pant, the Aoraki. Customize your perfect fit with our signature adjustable waistband and inseam (32-36 inch inseam). Available in Veil® Alpine® and Mossy Oak® Break-Up Country®. BUILD A STRONGER FOUNDATION with our new GWG® Stalker 1/4 zip long sleeve. Moisture wicking Spandex fabric with an antimicrobial finish will keep you fresh and cool from sun up to sun down. This base layer also doubles as a perfect wear-alone cool weather, early morning hunting top. Available in Veil® Alpine® and Mossy Oak® Break-Up Country®. *This tee is a fitted tee. For a looser fit, please go up one size. Due to extreme popularity, the Stalker 1/4 Zip Pullover is not available in sizes XS and Small until Fall 2018. This product can be found in Sportsman's Warehouse, Scheels and Cabelas Canada. Please check the size availability (2 week delivery) by sending an email using the contact button. Form fitting, If you want order one size up for more loose fit. Fur trimmed hood. Sherpa lined body. 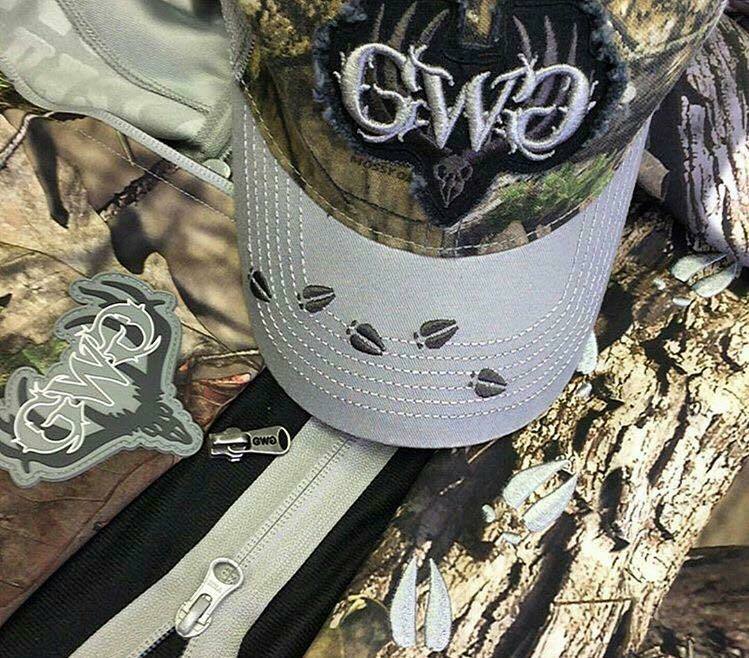 GwG Custom bullet zipper puller and GwG logoed cort ends. GwG puff embroidery on the back. - Lounge pants with scroll motif in glitter ink and GwG in hight Density ink. Please order one size up.